Thanks for your unproductive representation. 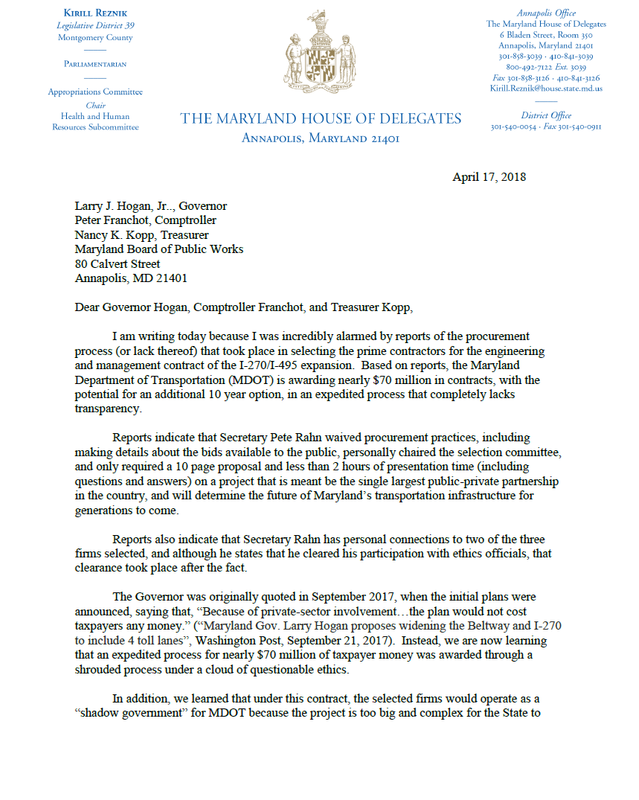 I’m one of your constituents who believes you bring no value to our district’s representation in Annapolis. You were appointed to the seat which gave you the advantage of incumbency. 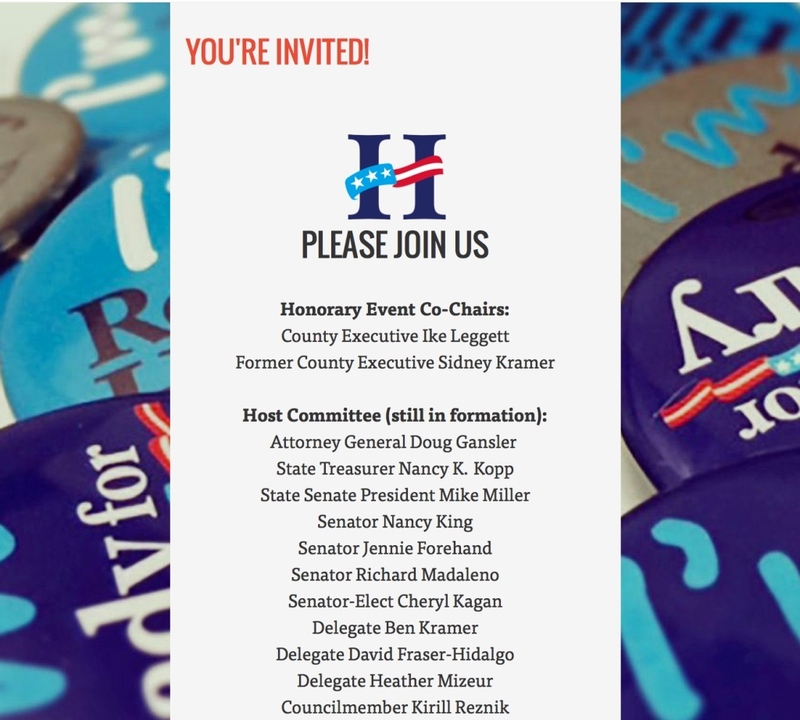 This time around there are several quality candidates running for delegate in our district. I and many others intend to do whatever is necessary to unseat you. District 39 can do better and deserves better than you. You now have the benefit of more unsolicited intel. MCGEO once supported Reznik, giving him five contributions totaling $4,100 between 2007 and 2011. What is their problem with him now? Renne is not shy so we will probably find out! Perhaps his casus belli includes Reznik’s support for Delegate Bill Frick’s End the Monopoly bill, a piece of legislation so objectionable to Renne that he famously promised to investigate the lifestyles of its supporters. Few interest group leaders make such open threats against incumbents. That’s because defeating incumbents is difficult and MCGEO is no better at it than anyone else. In recent years, the incumbents MCGEO has tried to defeat include Council Member Phil Andrews (D-3) in 2006, Delegate Al Carr (D-18) in 2010, Senator Nancy King (D-39) in 2010, Board of Education member Mike Durso in 2010, Council Member Roger Berliner (D-1) in 2014 and Senator Rich Madaleno (D18) in 2014. All of these candidates won by double digits except Carr and King. Berliner won by 57 points even though his opponent’s campaign was managed by MCGEO’s former Executive Director. MCGEO has supported two recent successful challengers to incumbents: Delegate Roger Manno (D-19) over Senator Mike Lenett and Hans Riemer over Council Member Duchy Trachtenberg (At-Large), both in 2010. Lenett lost in part because he blew himself up with horrible mailers such as this one about the Holocaust. Trachtenberg lost in part because she inexplicably hoarded $146,000 which could have been spent on campaign activity. Here’s the problem with making threats of this kind: you have to follow through and win or you look weak. Reznik has none of the weaknesses that sometimes result in incumbent losses in Montgomery County: he’s not a Republican, he’s not lazy and he doesn’t have legions of enemies at home. It’s also not clear that there are enough strong open seat candidates in District 39 to seriously threaten him. In fact, the smart move for the challengers is to court him and the other incumbents in hope of inclusion on their slate. All of this is good for Kirill Reznik and not so good for Gino Renne. 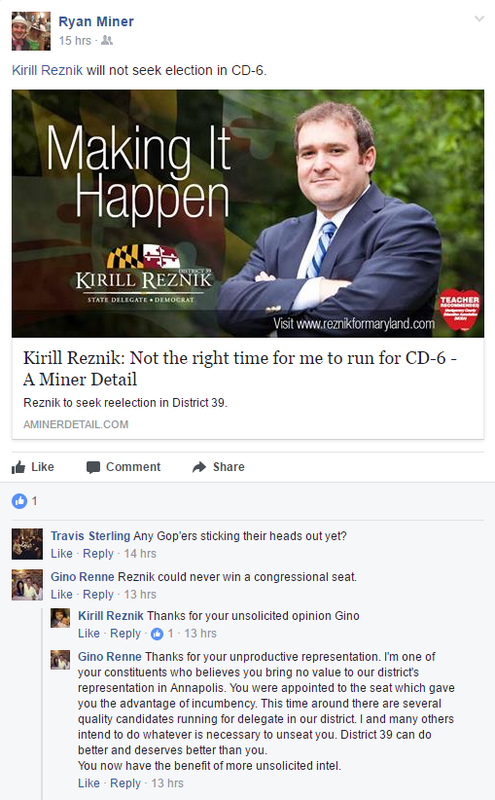 Could Anyone Stop David Trone in CD6? The future plans of Congressman John Delaney remain unclear, but that has not stopped some potential candidates from expressing interest in his seat. Two have filed paperwork to start raising money – Delegates Bill Frick (D-16) and Aruna Miller (D-15). It’s time to examine what a potential open seat race in Congressional District 6 might look like. 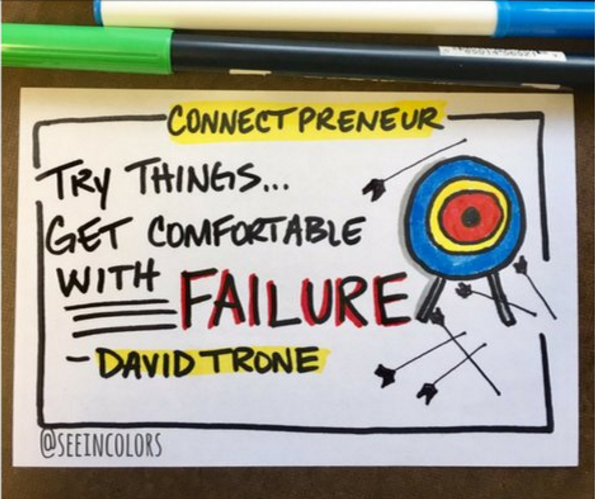 Let’s begin by asking the obvious question: could anyone stop David Trone? Trone, a co-owner of Total Wine and second-place finisher in the 2016 CD8 Democratic primary, is known to be looking at races for both Montgomery County Executive and CD6. Trone shares certain characteristics with Delaney: both are successful, center-left businessmen who live in Potomac and have been active political contributors at the national level before running for office. Delaney’s 25-point victory in 2012 over establishment favorite Senator Rob Garagiola (D-15) is no doubt encouraging to Trone because it provides a model for his own potential candidacy. So far, five Montgomery County state legislators – Frick, Miller, Delegates Kirill Reznik (D-19) and Andrew Platt (D-17) and Senator Roger Manno (D-19) – have told the Sun that they would consider running in CD6. There may be others as well as several Republicans. But let’s start with the MoCo Five. How do they compare to Trone? This is the elephant in the room. Trone set a record for a self-funding candidate for Congress last year. 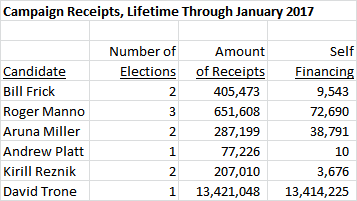 Here is how his potential MoCo rivals stack up to him in lifetime campaign receipts. Money doesn’t make Trone invincible. Senator Jamie Raskin (D-20) raised $2 million in the CD8 primary, was outspent by Trone by more than 6-1 and still defeated him by 7 points. But money is a big advantage for Trone and none of these MoCo legislators has proven that they can raise anywhere near as much money as Raskin. Unlike Trone, the five MoCo legislators represent legislative districts and presumably have relationships with their constituents. Here is the number of Democratic voters in the portions of their districts that overlapped with CD6 during the last mid-term primary, which occurred in 2014. None of these legislators represents a dominant share of CD6’s Democratic electorate. 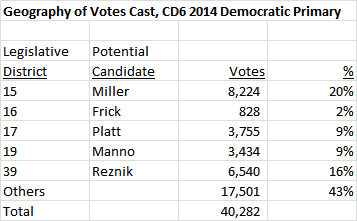 Two of them – Miller (20%) and Reznik (16%) – represent a larger share of CD6 than Raskin did of CD8 (14%). But Raskin’s in-district supporters were intensely invested in him and he was able to reach into other districts through many surrogates. These legislators would have to do something similar in order to acquire an advantage over the others. Now, what of the 43% of CD6 Democratic voters who do not live in any of these districts? Aside from the handful who reside in four precincts in Legislative District 14, they live in the district’s four Western Maryland counties. In the CD8 primary, Trone won absolute majorities of the vote in both Carroll and Frederick Counties. Trone also won pluralities in Damascus, Gaithersburg, Glenmont/Norbeck, Potomac and Rockville. The implication is clear: if each of these legislators gets in and holds most of their home territory, Trone could still win by running up big margins in Western Maryland and picking up pockets of votes in UpCounty MoCo. Let’s remember that MANY of these residents were exposed to Trone’s millions of dollars in broadcast TV commercials last year. Most of Trone’s potential rivals have not won an intense, hard-fought election like last year’s race in CD8. Frick and Reznik were originally appointed to their seats. Miller was inducted onto the District 15 incumbents’ slate in 2010 prior to winning an open Delegate seat. The exception is Manno, who withstood some of the most depraved political attacks in recent MoCo history when he took out incumbent Senator Mike Lenett (D-19). But CD6 is much larger than D19 and the potential reach of Manno’s prodigious door knocking – his favorite campaign tactic – is in question. The thought of a wiser, more experienced and more strategic Trone should inspire dread in potential opponents. And yet, Trone can be beaten. Let’s look at the man who did it. Jamie Raskin started out as one of MoCo’s best-ever challengers when he defeated twenty-year incumbent District 20 Senator Ida Ruben. He spent the next ten years building progressive networks at both the national and local levels. The former helped him raise millions of dollars; the latter gave him a grass-roots army that has been seldom seen in this county. No prospective CD6 candidate checks all those boxes. It will take two things to stop Trone if he runs for an open seat in CD6. First, most of the MoCo legislators mentioned in the Sun would have to not run, thereby giving the remaining candidates room for electoral growth. And second, one of Trone’s rivals would have to run the race of his or her life, far exceeding previous performances. Raskin proved that it can be done. But can it be done again? On February 4, representatives of Montgomery County’s Department of Liquor Control (DLC) headed to Annapolis to brief the county’s state legislators on their operations. The stakes were high. DLC’s Executive Director had abruptly left his position six days before and legislation was pending on whether to allow voters to decide on opening up the monopoly to private sector competition. As of this writing, 2000 people have signed a petition in support of that legislation. DLC has had problems and has been promising to make improvements for a long, LONG time. Consider the following. Ten years later, the county’s Inspector General found that DLC’s warehouse was being run with sticky notes. The Inspector General found that the warehouse was missing as many as 154 cases a day without anyone investigating why. The same problems persist a decade later. Many licensees would not refer to the DLC as “a crazy aunt” because that characterization is far too kind. In late November, the County Executive said that complaints about DLC were “overblown.” One month later, DLC suffered a historic delivery meltdown in the week between Christmas and New Year’s Eve. Last June, DLC developed an “Improvement Action Plan” to improve its operations. The Restaurant Association of Maryland surveyed its members about how DLC was doing eight months after this plan was adopted. Here are a few survey responses from restaurant owners and managers on a number of issues. What frustrates me the most is the lack of care/regard for special order items. After waiting 15 days for certain cases of wine, I get a camera shot from my vendor who is at the warehouse staring at all the missing cases just sitting in my designated space. Infuriating! Not been able to speak to someone who knows what is going on with my order 2) If you run out of product, good luck getting it back in stock at a reasonable time with a once a week delivery and order system is impossible to keep availability. 3) For weeks I was out of several wines and after waiting and talking to the sales rep. I was informed that the wines were delivered to the county. Called them and talked to several people without a clear answer so I decided to go to DLC and find out what they had there for me. They were surprised that the wines were there because they could not find them on the computer as being delivered and in my cubicle waiting for weeks to be delivered. The DLC constantly runs out of inventory, delivers late and never apologizes. Also, anytime you go to the DLC to pick stuff up, all you see are guys standing around by the ‘no smoking’ sign, and smoking. They are lazy and many of them do nothing. Products that should be widely available are out of stock – Blue Moon six pack bottles, Corona 24 oz. cans, Sierra Nevada six pack bottles. I was charged for 6 cases of stock wine that NEVER CAME! I spent hours on the phone trying to resolve the issue. They sent the 6 cases . . . of the WRONG wine 2 weeks after the fact. Never refunded the money and wouldn’t take the order back. It is impossible to know track on the DLC website how much will be pulled out of your bank account and when. The amounts directly debited from our bank account never match the invoices. The DLC doesn’t care for or understand the products they are delivering. It’s why we receive wrong boxes, out of date items, improperly handled merchandise and a general sense lacking of any genuine appreciation for their jobs. Over all there is no sense of urgency or organization with the DLC. Paying 20%+ for product over what we pay in DC is just insane. Recently we did not get product in for a wine dinner we were having and we placed the order 3 weeks prior and they even showed it as an in stock! The above history makes it obvious that DLC’s promises to improve cannot be believed. 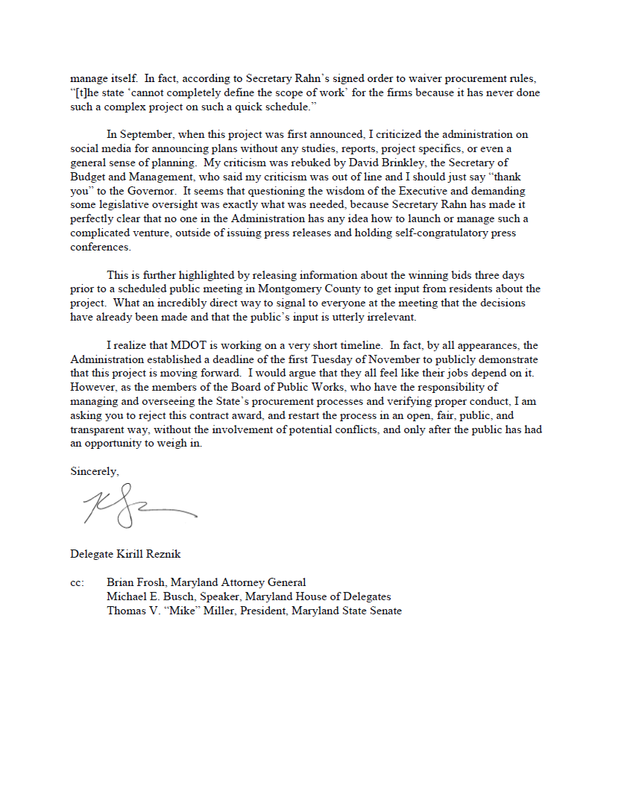 Delegate Barkley is right; they are trying to run out the clock and prevent anything positive from getting done. And what should get done? Thousands of people know the answer: End the Monopoly. Mizeur is Ready For. . . Outgoing Appropriation Chair Barbara Mikulski, a Democratic icon in this state, was working the phones to urge support for the budget compromise. 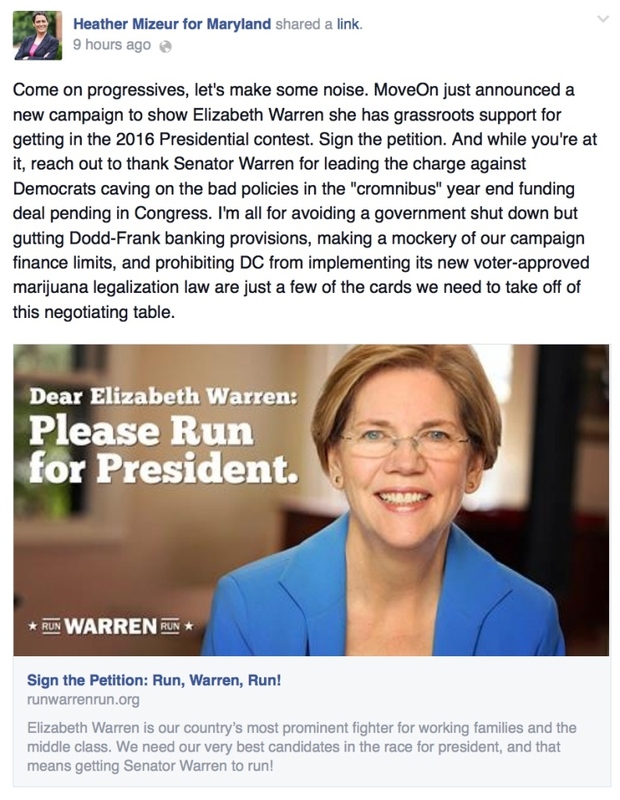 As became clear to all this year, Heather is a campaign expert and perhaps tying herself to Warren makes it easier to position herself as a progressive alternative to Mikulski in 2016. 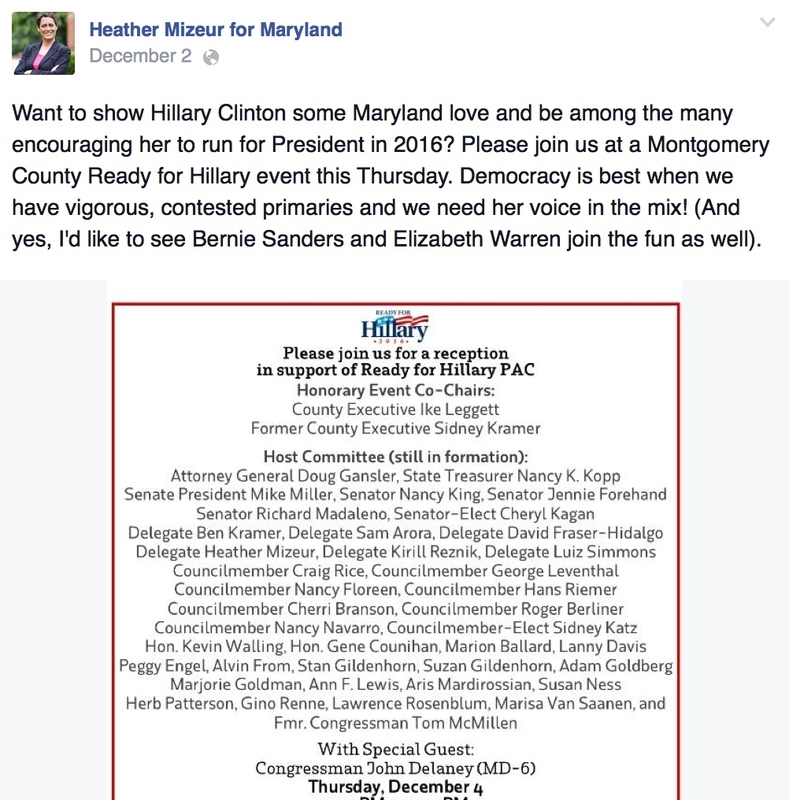 The many who read the Washington Post and see the Ready for Hillary invitations but do not read her the fine print on her Facebook page might not realize that Heather is more Ready to Consider Hillary rather than Ready for Hillary.